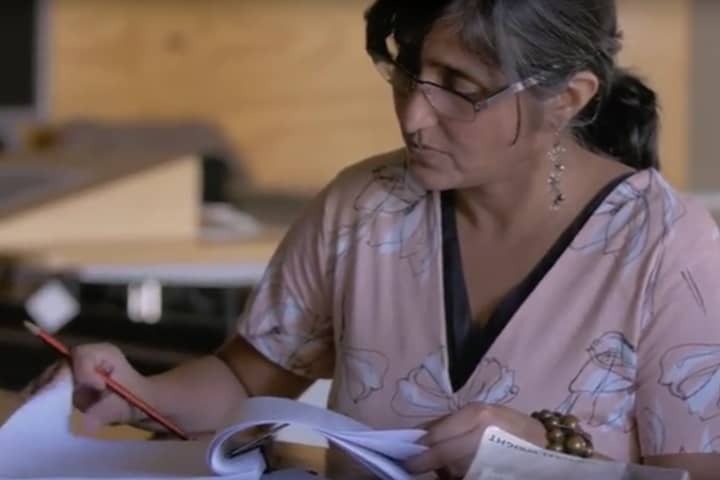 MTC Scenic Artist Tansy Elso has created a stunning replica of Flagstaff Station for the set of Melbourne Talam by Rashma N. Kalsie. 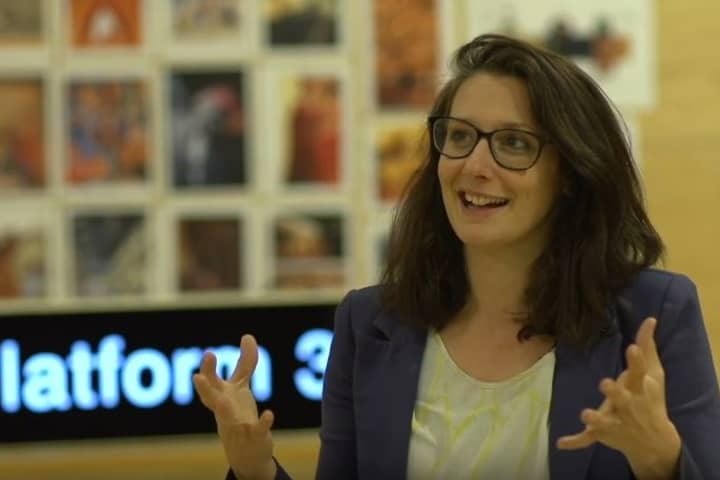 Read on for insight into this creative process. However, there were some artistic changes to be made too. For example, Andrew wanted the set to have yellow tactiles instead of white ones, and the level of aging, grit and grime was scaled back. Important discussions happen at this stage of every set design process, before painting commences – to decide what details to keep and what to edit out. 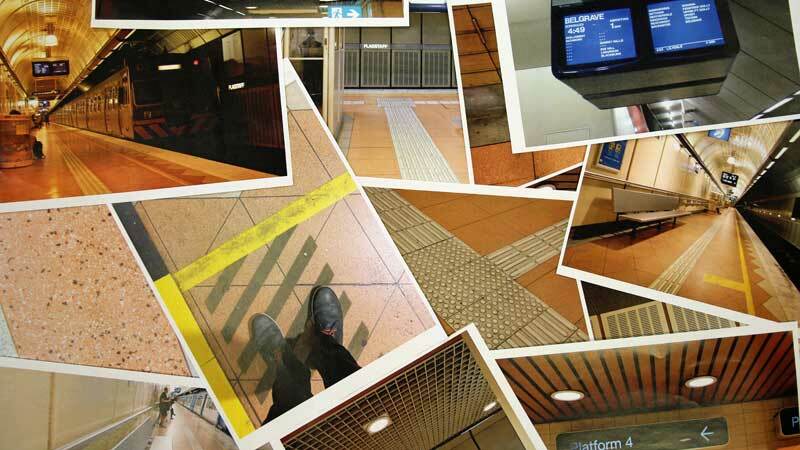 While she was painting the set, Tansy often got off the train early at Flagstaff Station to check details of the site. 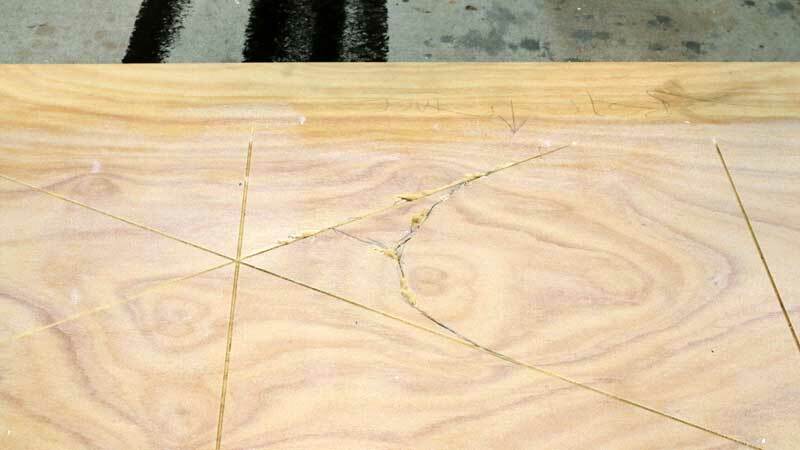 The workshop prepared panels of high-grade plywood with grout marks pre-cut using a circular saw. High-grade wood was used to help emulate the ‘flat’ look of the stone tiles. Tansy also chiselled cracks into the wood, and rounded off the edges of some tiles, to create further detail and show the ‘history’ of the platform. Tansy began by rolling thin acrylic texture paint onto the plywood. A second coat was applied later in the day. This helps to further smooth the plywood and eliminate grain, and prime the surface for the artwork to follow. At this stage, Tansy paints the dark colour that will sit in the grooves to mimic the grout. 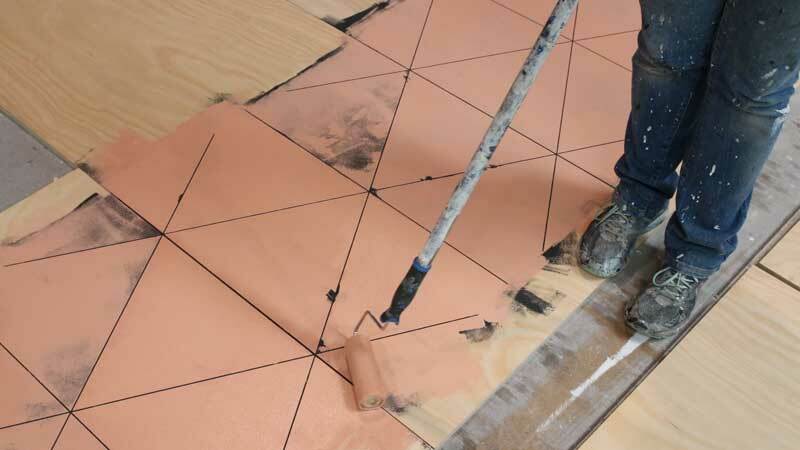 The peach-coloured base coat was applied with a short nap roller to ensure the paint didn’t drip into the grooves. 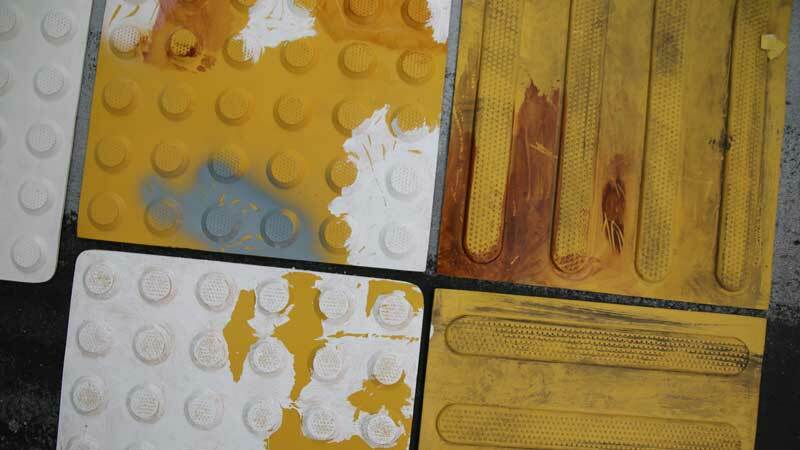 Tansy used a deliberately light touch in some areas to create ‘variation and character’ on the platform. Scenic art is about layering, mostly using a technique of building up rather than taking away. In this regard, the technique is similar to that used in watercolour artworks. While the grime and pitting on the real tiles has accumulated over time, Tansy mimics it here with the absence of paint. A second coat of this base colour was also applied the following day. 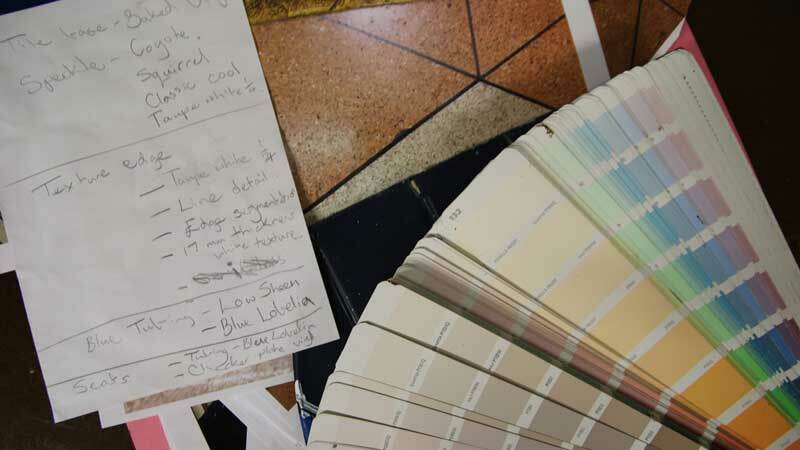 Here you can see some of the colours Tansy and Andrew selected for the detail on the terrazzo tiles. 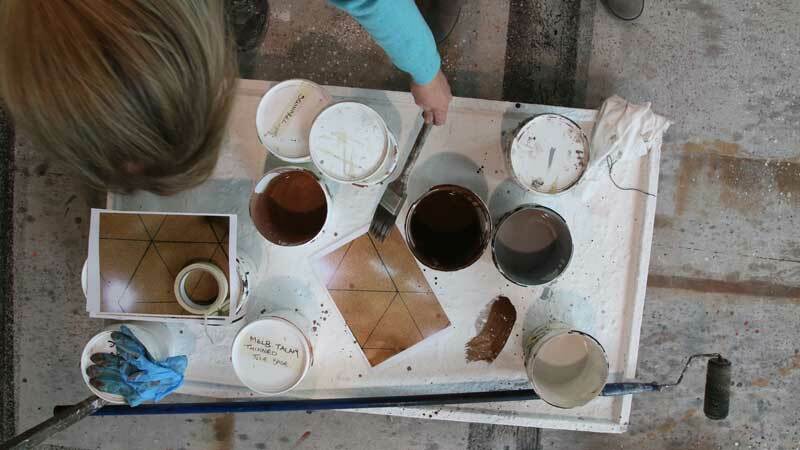 Tansy uses a paintbrush to splatter each of the colours onto the surface to create the terrazzo effect. 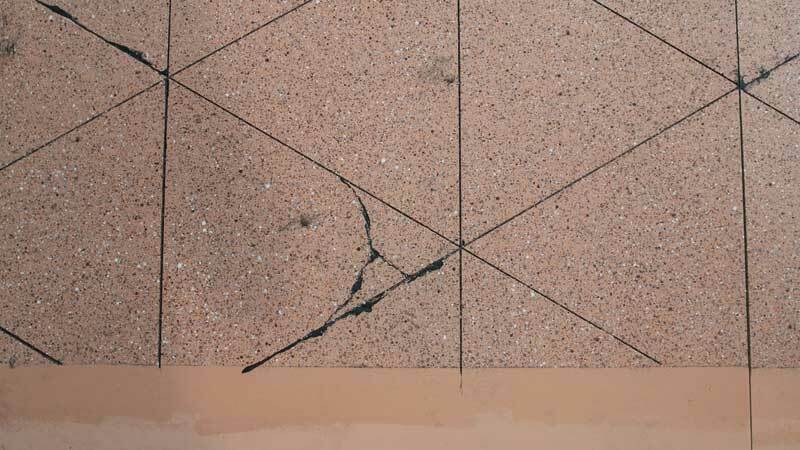 The outcome varies depending on how thick the paint is, so Tansy didn’t dilute the paint in order to create a tight, fine splatter that mimics the stone. Tansy did several tests on tactiles to mimic the grime and dirt. 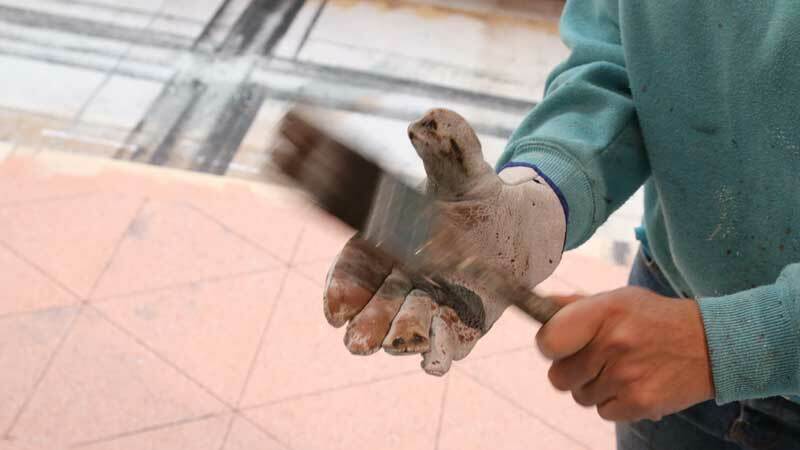 A variety of different products were used, including spray paint and charcoal, until she found that a thin coating of scene paint and floor glaze rubbed into the surface created the desired effect. Washing liquid was also added to stop the wash beading on the surface. At this stage Tansy applies a very thin layer of ‘dirty wash’. Tests are done beforehand to ensure the correct level of ‘dirty’ is achieved. 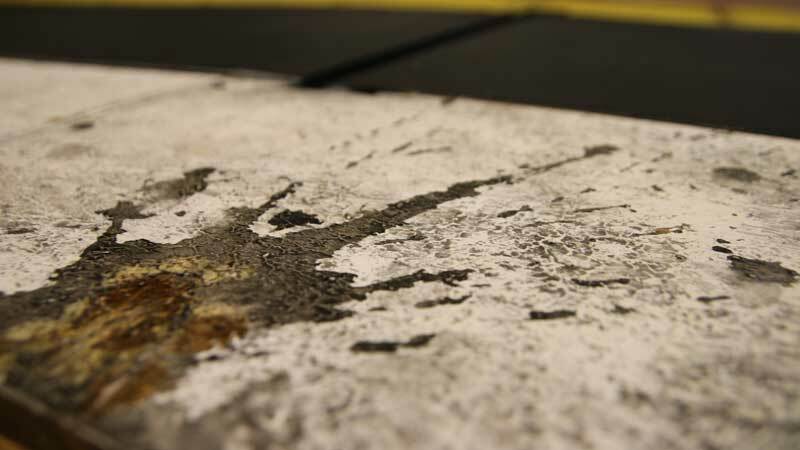 An acrylic texture laced with perlite, which is a common gardening ingredient, is then used to create texture on the white non-slip platform edge. 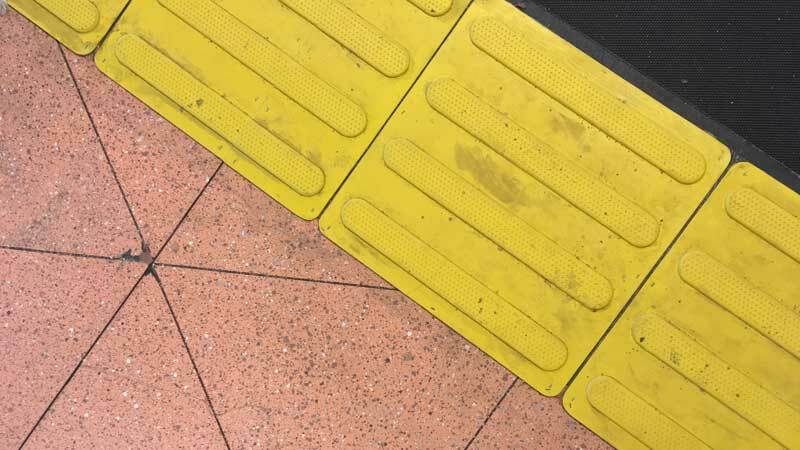 This is a ‘trick of the trade’ Tansy says, and creates a rough texture to replicate the non-slip edge of a suburban train platform. Once the artwork is finished, a clear satin lacquer is applied. 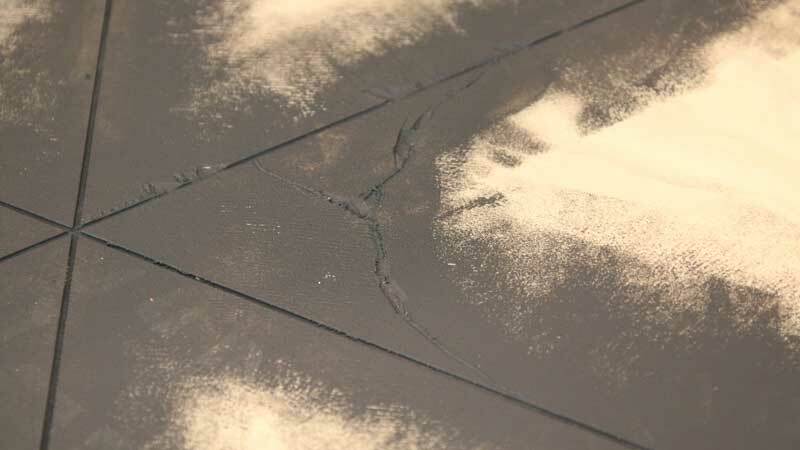 This domestic floor sealer gives it the lustre of the tiles and protects it from wear and tear as the cast rehearse. 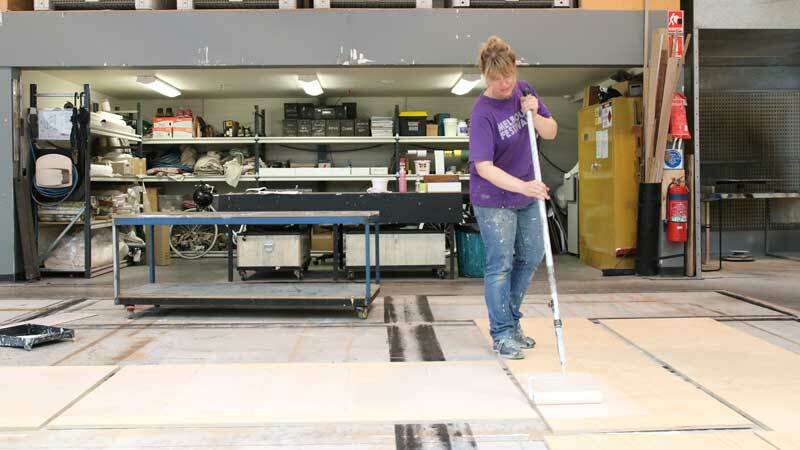 Considering this production will tour and the set will be washed before each performance. Two coats of this lacquer are required. 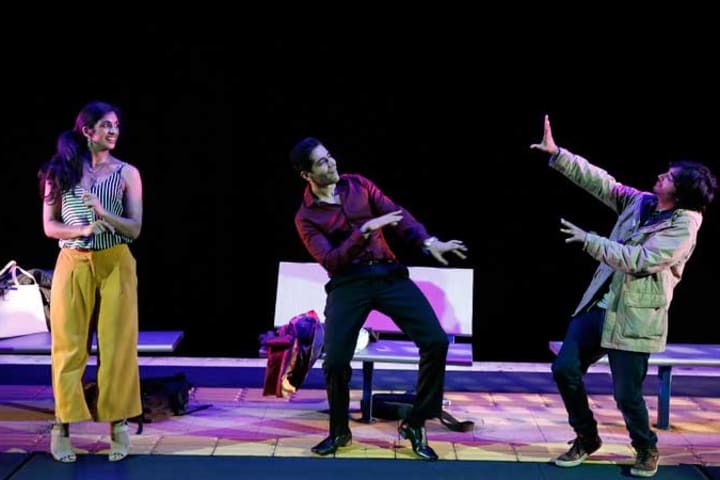 Melbourne Talam features on the VCE Drama Unit 3 Playlist and will tour to Regional Victoria (Mildura, Warrnambool, Bendigo, Shepparton, Wodonga, and Geelong) from 23 May. 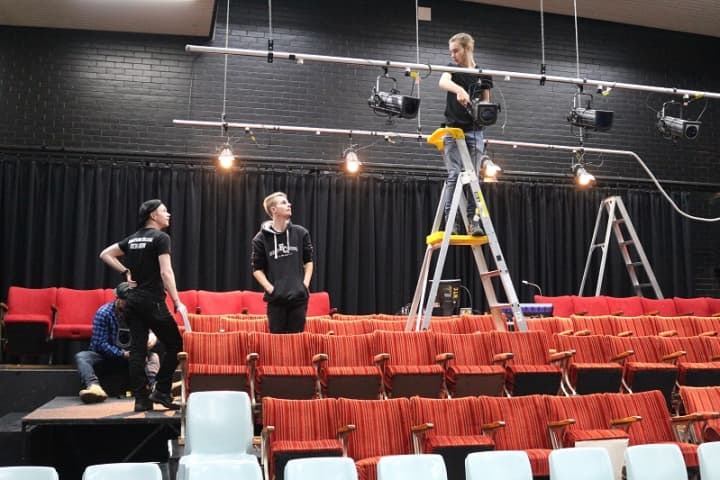 Developed through MTC CONNECT, and the NEON and Cybec Electric play development programs, this vibrant production directed by Petra Kalive will put our city’s contemporary social issues at centre stage.